I went through a phase in middle school where I read nothing but Greek mythology – yes, for fun. I don’t remember what sparked this interest, but I do remember it being pretty intense of an obsession. This has echoes nowadays in trying to guess the myth in a Renaissance painting before looking at the title, and getting miffed at how often Hades and the underworld are portrayed as equivalent to the Devil and Hell in popular culture (seriously! Not the same). I think I will always carry a soft spot for Greek mythology. 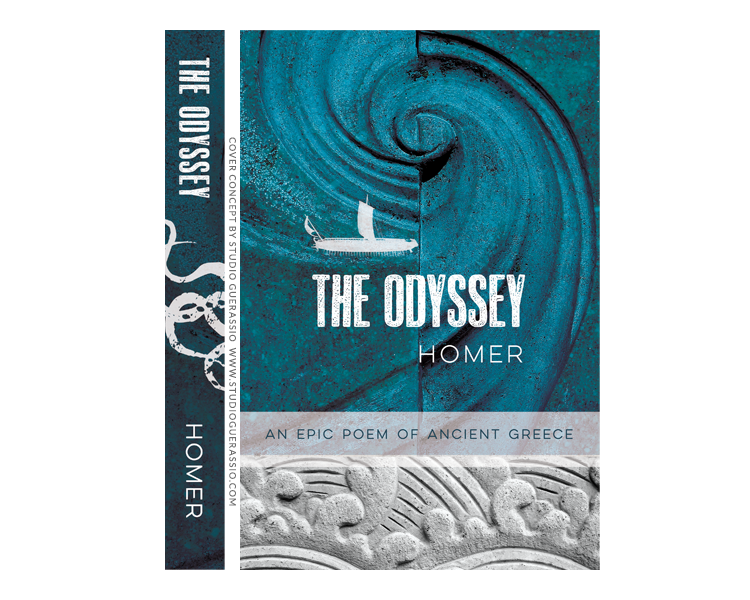 That’s why for the 2nd post in the Covers Reimagined series, I’m sharing my take on a cover for The Odyssey, by Homer. I’m going to assume you have at least passing familiarity with the story, as it is required reading in a lot of high schools and colleges. 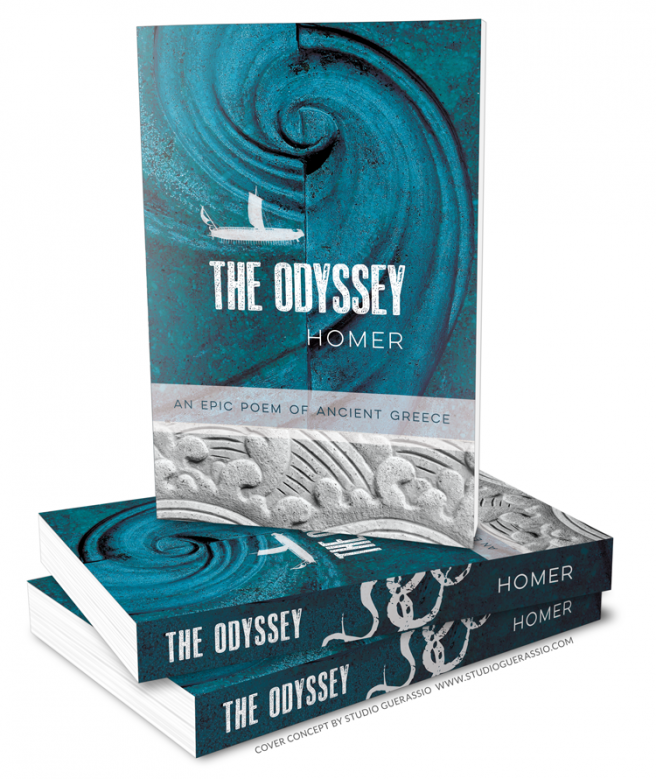 But just as a refresher, it’s the tale of the Greek strategist Odysseus, on his journey home from the Trojan War back to his kingdom of Ithaca. He manages to piss off the god of the ocean, and what should be a fairly simple journey turns into a 10 year odyssey, full of monsters, dangers, and our hero’s trademark cunning to escape both. Notable episodes include his encounters with a cyclops, the witch Circe, the Sirens, the monster Scylla and the whirlpool Charybdis. I favor photo-based covers, as you might have noticed, which proved a particular challenge with this cover. There aren’t exactly any photos from Ancient Greece lying around. There are, however, lots and lots of sculptures and stone carvings from the Greek age, which is why I ultimately went with the textured stone look. 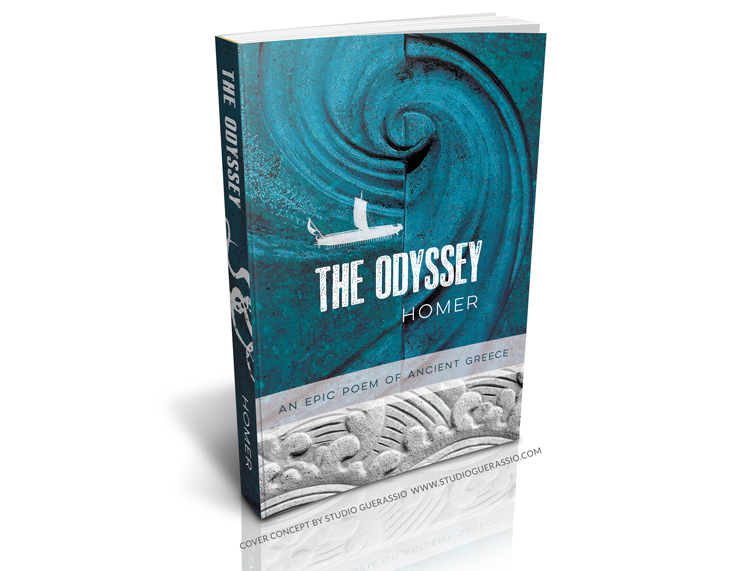 I think it helps convey both the age of the story and the gritty nature of Odysseus’ adventures (let’s be honest, there’s quite a bit of death and mayhem in the Odyssey – Greek gods didn’t pull their punches when they were pissed off). This is also why I used a roughened typeface for the title, to tie in with the stonework. The color scheme of ocean blue and grey seemed a natural choice for a story with so much focus on voyaging over the sea. The ship graphic was included to also convey the idea of a voyage and adventure. The tentacles were included to pay homage to Scylla and the story’s many other monsters. The choice of a clean typeface for the author and subtitle was to give a bit of contrast to all the roughness. Overall, I’m pleased with how it turned out. I think the photographs are a nice modern touch, while the textures and coloring evoke ancient ocean. What do you think? Did I hit the bullseye as Odysseus would have? If you’d like to get more posts in this series straight to your inbox, sign up for my newsletter here. 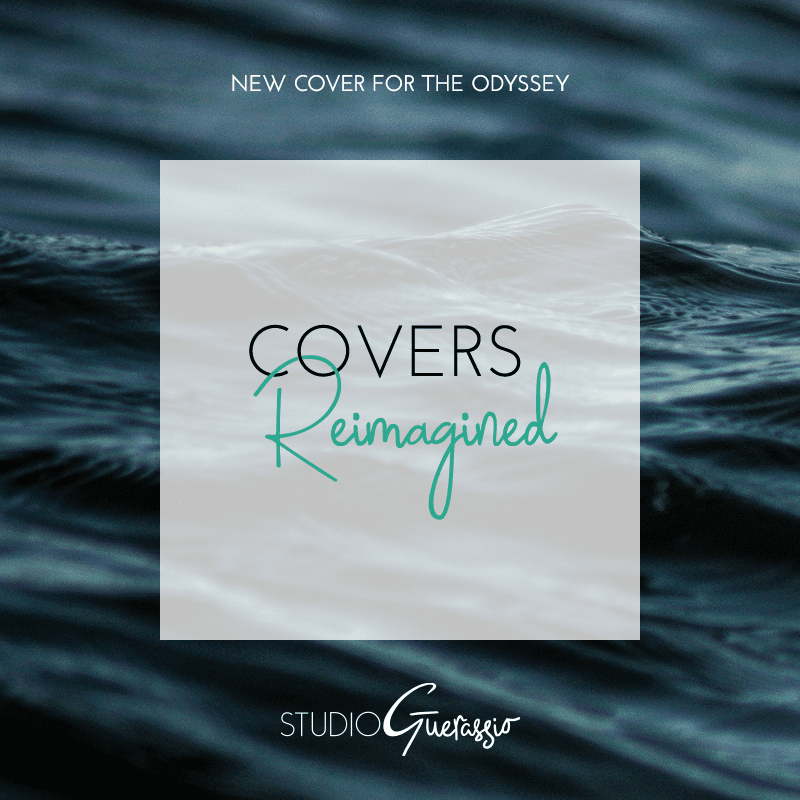 If you are an indie or self-pub author in search of the perfect book cover, I have just the thing: The Pageturner design bundle, for everything you need to pimp your book. Creative Commons credits: Manfred Antranias Zimmer, b0w1e, Aaron G, and Wikimedia Commons.